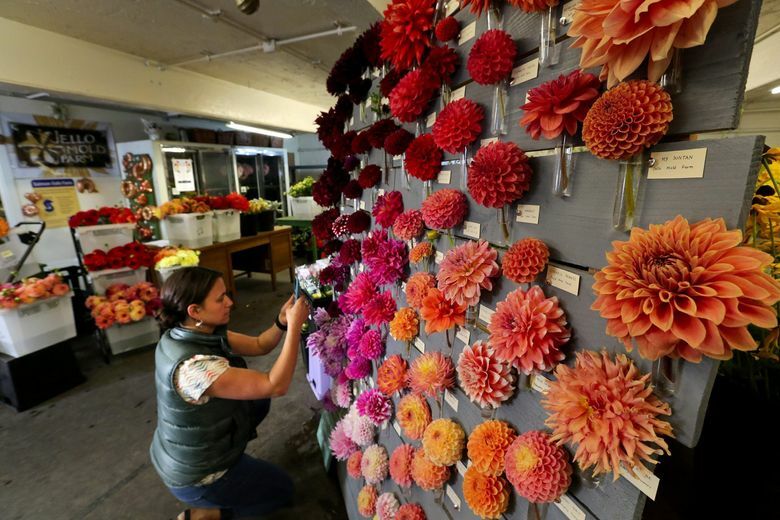 This year’s hot, dry weather meant an extra-long season for growing and selling dahlias, the showcase flower for the 13 members of the Seattle Wholesale Growers Market. 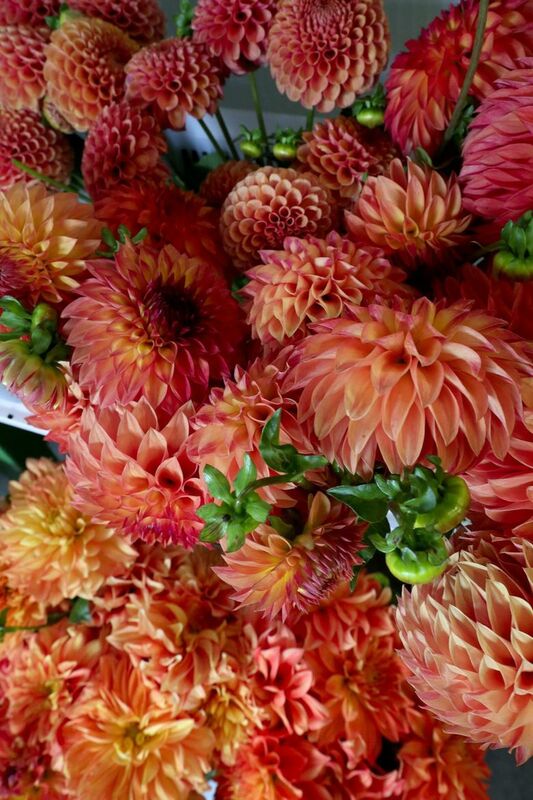 A speckled pink Carmen Fiesta, piercing red Audrey Grace, coral-colored Teddy, or any of the 150 other varieties of dahlias — whichever a florist is looking for, chances are Seattle Wholesale Growers Market will have it. 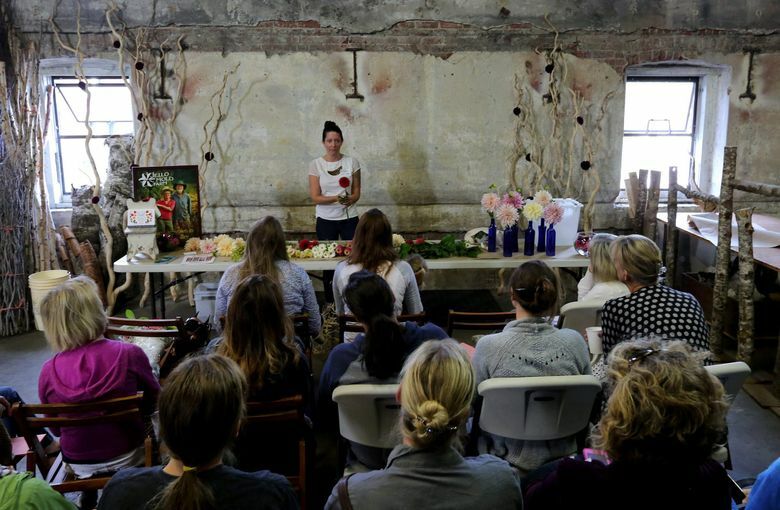 Dahlias are the largest crop for the cooperative, a group of 13 Pacific Northwest flower growers with a shop tucked in among the old brick facades of Georgetown warehouses. This summer’s hot, dry weather has brought danger, extra cost and lost revenues for some Washington businesses. 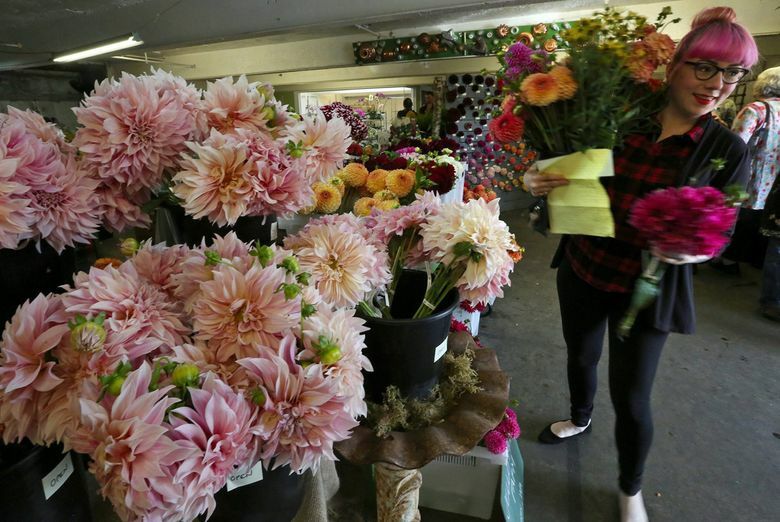 For the flower growers, however, it meant dahlias came almost a month early, extending the summer crop’s season and increasing sales, said Molly Sadowsky, the co-op’s market manager. 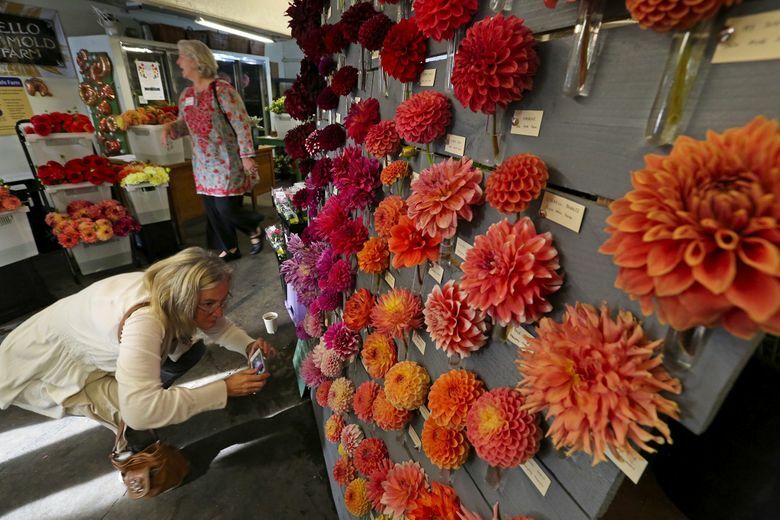 “The demand is always there, and this year we actually have the product to sell,” she said after the co-op’s annual Dahlia Festival for florists Wednesday in Georgetown. Other popular flowers at the co-op include peonies, hellebores, roses and unique greenery. The co-op started in 2011 as an effort to lower distribution costs for growers and give prospective buyers a greater selection of local flowers to choose from. Since then, it has hired more staff, changed its business model and dramatically increased sales as locally grown flowers have become more popular and the co-op has become more well known. With five more weeks of the prime summer-selling season still to go, the co-op has already exceeded its total 2014 sales of $630,532. So far this year’s sales are 60 percent ahead of last year, and the number of customers jumped from 339 last summer to 453 this summer. Customers include retail florists and florists who create arrangements for events — often weddings — as well as some supermarkets, restaurants and hotels. The co-op began like an indoor farmers market, with each farm leasing its own stall in the warehouse and ringing up its own sales, which made transactions complicated for the customers. The taped lines still visible on the concrete floor are remnants of that setup. Many of the farmers who live far from Seattle found it hard to tend to their stalls, meaning someone at the growers market often had to do it for them. With the help of two U.S. Department of Agriculture grants totaling $338,0000, the co-op has hired two full-time employees and three part-timers. That allowed it to change the business structure so that all flowers are rung up at the front counter — but most farmers are still there at least a few days a week to interact with the customers. The co-op gets 30 percent for overhead — rent and paying staff — and the farmers get the remaining 70 percent. Diane Szukovathy, co-owner of Jello Mold Farm in Mount Vernon and co-founder of the wholesale market, compares developing the business to raising a child. The new business structure allows for a unified, focused approach to business, which Szukovathy said couldn’t have been done without the grants. July’s sales hit $136,104, almost $30,000 more than projected, and August is looking to be even better. After exceeding the revenue target time and time again, Szukovathy said the co-op is on track to thrive after the grants expire this year. Tobey Nelson, owner of Vases Wild on Whidbey Island, said she uses Seattle Wholesale because local flowers are important to her and are an extension of the eat-local movement that is rapidly gaining popularity. Eleanor Blackford, owner of floral-design company Bash and Bloom in Seattle, said she also loves knowing the farmers, who are usually at the market on Wednesdays, when most florists shop for the weekend. Dan Pearson of Dan’s Dahlias in Oakville, Grays Harbor County, said he started growing dahlias at age 10, saving his money to pay for four years of college for his degree in landscape architecture. Pearson, also among the co-op’s founders, said he gets twice what he would get selling his flowers to a local wholesaler.